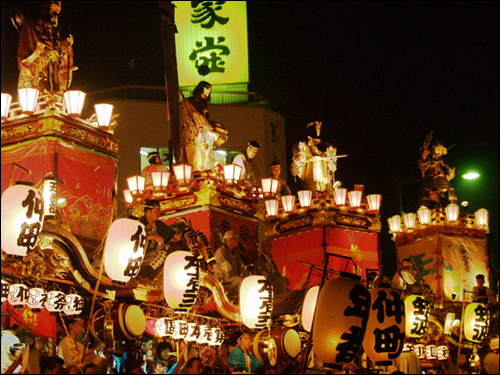 Summer time is the time for matsuri -- or festivals -- in Japan. 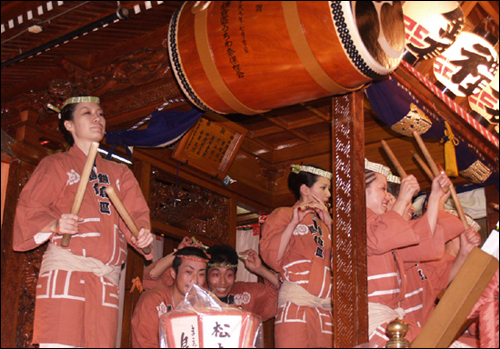 It seems like just about every city, town and village has some form of matsuri going on throughout the summer. Somematsuri are famous and pull in people from all over the world. Others are more local events. But big or small, matsuri can be a lot of fun. 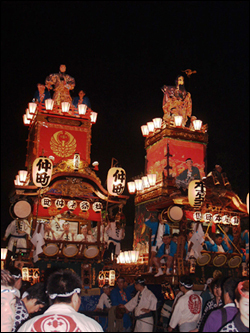 Just north of Tokyo, the small city of Kumagaya hosts several matsuri throughout the year. The Uchiwa Matsuri held at the end of July seems to be held just for the sake of having a good time. The origin of this festival is rather mundane. In the late 19th century, shops would hand out free fans -- Uchiwa -- to all passerbys and customers around the third weekend of July. Perhaps the sudden generosity of the shop owners so surprised the citizens of Kumagaya that they felt like putting together a festival just to celebrate it. Uchiwa are flat fans originally constructed of paper and bamboo. Nowadays, plastic and wood is more often used. They are often carried at festivals. Stores of today and yesteryear pass out free Uchiwa as advertisements with the practical (not too mention thoughtful) purpose of fanning oneself off during the hot, humid Japanese summer. Uchiwa are thought to have come from Korea. As it is, Kumagaya, generally has the highest temperatures in the Tokyo region during the summer. Free fans would have been a blessing before the advent of electric fans and air conditioning. 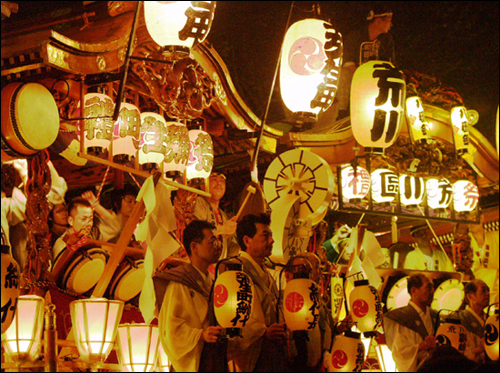 Summer matsuri serve as a traditional means of escape from the oppressing humidity that is the Japanese summer. These events allow the Japanese to forget their weather-induced misery for a while as they kick up their geta (wooden clogs) and dance. The citizens of Kumagaya no doubt felt they needed a matsuri to save them from the high temperatures they repeatedly suffer from and thus (perhaps) the Uchiwa Matsuri was born. 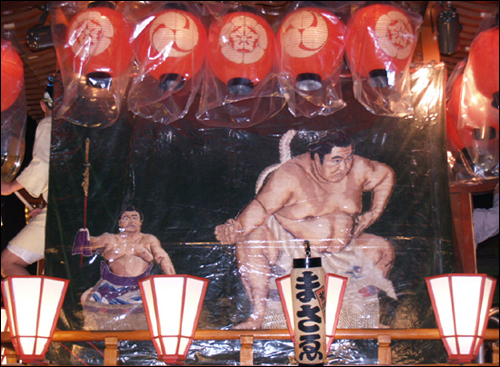 Images of sumo wrestlers decorate a float. As matsuri go, the Uchiwa Matsuri is not very famous. I had never heard of it even though I had a book on Japanese Festivals. Many of my students who lived in the Saitama region north of Tokyo where Kumagaya lies had never heard of it either. I stumbled across a reference to the festival in a newspaper just by chance only a few hours before going to it. Doing a little research on the net only netted me a blurry cell phone picture of one of the festival's floats. Armed with such little information, I decided to chance it anyway and give the unknown Uchiwa Matsuri a try. I was pleasantly surprised by what I found. 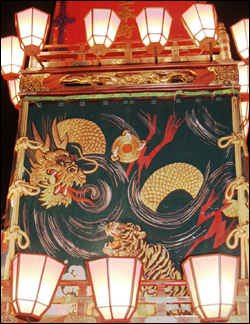 A tiger snarls at a dragon on this float. Kumagaya was packed with people to see what I thought would be a minor event. Following the crowds and the noise, I found a large half-circle of a dozen rather sizable decorative floats filled with drummers and flute players. They were making a cacophony of noise by beating drums, blowing on shrill flutes, and banging platters of metal. It was like a medieval-version of heavy metal garage band. Five of the floats were quite tall and were topped with a mannequin figure representing legendary persons from the past. One figure was Jimmu, the legendary first emperor of Japan who supposedly ruled Japan in the 5th century B.C. -- there is no evidence to support this, however. Jimmu according to ancient tradition was the first human emperor of Japan. He supposedly reigned in the 5th Century B.C. He is often depicted carrying a bow accompanied by a crow. The crow was Yatagarasu - a three legged crow that came from heaven to aid Jimmu in conquering the land. Jimmu extended his kingdom from the southern island of Kyushu into the mainland area that is today Kansai. There is no evidence that Jimmu ever really existed but his story is believed to be an echo of the migrations of the Yamato people from Kyushu to Kansai. The head of the Yamato would eventually become the Emperor of Japan. Another was an early hero -- Prince Yamatotakeru. The only true historical character was Kumagai Naozane, a warrior of the late 12th century. Kumagaya is named after this warrior who was born in the area. He was famous for fighting and reluctantly killing a young samurai in the Gempei War. Yamatotakeru was the crown prince during the reign on Emperor Keiko in the 2nd Century AD. He is one of the first folk heroes of Japan and served as a proto-type for the samurai of later ages. One of his most famous exploits involved a bit of crossdressing. A powerful local enemy was causing problems in the realm. To defeat him, Yamatotakeru disquised himself as a maiden and entered his enemy's camp successfully. So convincing was his disguise that the leader was smitten by the prince in drag. He drank long into the night with his newfound love until he fell into a stupor whereupon Yamatotakeru stabbed him to death. His sneaky tactics seem to have inspired the later-day devious Ninja more so than the straightforward samurai. After a time the floats were pulled away down the streets to regroup in the town center where even more people gathered. It was so crowded that a person could hardly even wave a fan to cool themselves. 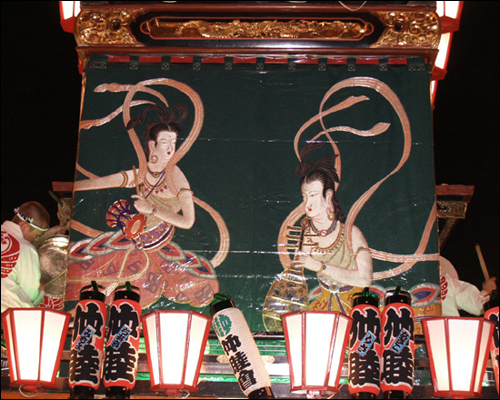 A pair of Japanese angels grace this Uchiwa Matsuri float. Noise, noise, noise seemed to be the order of the day at the Uchiwa Matsuri. But one thing I noticed conspicuously absent on all those decorative floats was any mention or depiction of the festival's namesake -- fans. Sure, there were fans a-plenty in the crowd both folding and flat but this was to be expected considering the heat. I was expecting floats that were either in the shape of fans or floats covered with fans. Perhaps given the heat, fans on floats would have been seen as a dreadful misuse. However, despite the fanlessness of the festival, I thoroughly enjoyed the Uchiwa Matsuri. It was a wonderful, unexpected surprise.